There is a reason why we choose to focus all of our attention on Google: You’ve got to go where the eyes are. 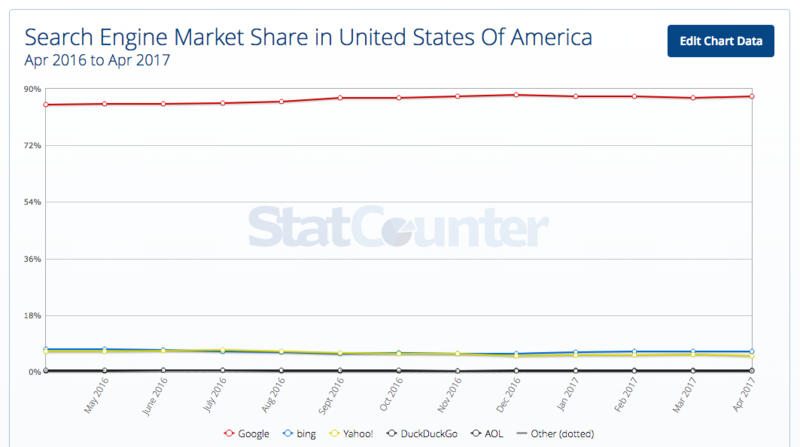 According to StatCounter, Google controls 87% of the search volume query in the United States. Check out this visual and you will see why it makes sense to focus on Google Adwords when running your Pay Per Click campaign. So the next logical question is: How do you run a successful Adwords campaign? Okay, this advice is going to go counter to a lot of other advice you may read out there. The reason we often run counter to general advice is because in our experience, some of our best-performing keywords (in terms of conversions) are short tail keywords. So when creating new campaigns, we actually bid against broad and short tail keywords. There is a simple reason for this: volume. Volume gives you data, and once you have data, you can make informed decisions. This is not to say that keyword research isn’t necessary. Quite the opposite: do your research, find those long tail keywords, weed out those non-relevant keywords, add those obvious negative keywords, but don’t exclude the common keywords. 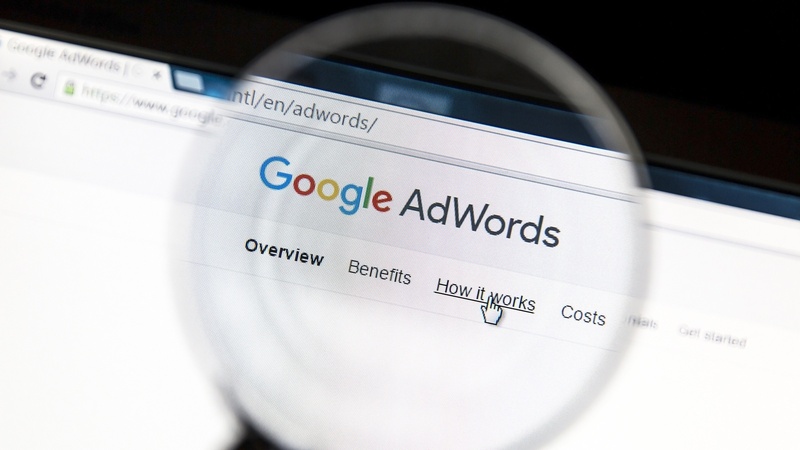 However, in order to follow this strategy, you need to be diligent about monitoring the performance of your Adwords campaign. Check in frequently and add in negative keywords that the broad searches turn up and are not relevant to your campaign. Segment the high-performing keywords into their own campaign or adgroup so you can write highly-optimized ad copy that matches the searcher’s intent. People come up with some pretty crazy search terms, and even if you have been doing Adwords for years, you can’t possibly think of them all. So don’t. And yes, if the data proves that the broad and common search terms are poor performers in terms of click-through rates and/or conversions, exclude them. Do you want to improve your quality score? How about keeping your cost per click as low as possible? What about getting people to actually click on your ad? If your answer is yes, then you need to A/B test your ad copy, which will allow you to discover which version drives more clicks to your landing page. The easiest way to A/B test is to create two versions of the same ad. Run both at the same time. Don’t be lazy and let Google choose the winner; instead, use a Split Tester tool like Perry Marshall’s Split Tester to see which one wins. Then take the loser, delete it and create another similar, but slightly different, version of the winning ad and test again. Something else to keep in mind is to look at not only the click-through rate, but also the conversion rate. Sometimes a lower-clicking ad has a better conversion rate. For this, there is no easy answer; it will take some serious thinking and testing to find out what about the copy drove a lower/higher click rate while at the same time having a higher/lower conversion rate. By taking the time to continually test your ad copy, you will, over time, see the benefits of lower cost per click and get more clicks to your landing page. We have all been victims of a wild goose chase. We search for something like red roses and are led to the home page of a flower shop, where, once again, we have to click a bunch of times to find those red roses. I don’t know about you, but I don’t have the patience to do yet another search. The biggest mistake we see in Adwords is when companies use their home page as their landing page. There are some very good reasons why you need a dedicated landing page. Here are some quick wins: If you are an ecommerce site, take them to the category, sub category or even product page if your ad is specific enough. If you are a B2B company, make sure that your landing page is directly related and solves the problem that the searcher is looking for. Oh—and, just like ad copy, TEST! Test your landing page for conversion rates. Sometimes the reason for low conversion is the ad copy, but quite often, it’s the design and content of the landing page that has the most influence on conversion rates. A large part of running a successful Adwords campaign is testing and measuring results. The strategy of fire and forget simply does not produce results. You should be checking your Adwords account frequently so that you can monitor and optimize your keywords, ad copy and landing pages. Is your website producing the results you are looking for?